HP Star Wars™ Special Edition Notebook | A Savings WOW! Do you love Star Wars and/or need a new notebook? 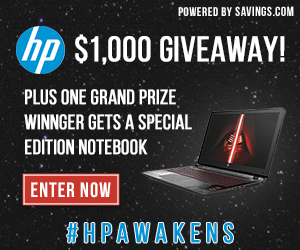 Hurry over to Savings.com and enter to win a an HP Star Wars™ Special Edition Notebook! This giveaway is only through tomorrow night at 11:59 PM ET (or 10:59 PM CT). This giveaway is being hosted to celebrate the announcement that HP, Inc. and Hewlett Packard Enterprise are separating into two new companies. – The giveaway runs from Sunday, November 1st at 12:00 AM ET to Monday, November 2nd at 11:59 PM ET. – One (1) winner will receive a Star Wars™ Special Edition Notebook, valued at $699.99. – Ten (10) winners will receive a $100.00 gift card to HP. – Users can enter the giveaway by heading to the HP page on Savings.com and submitting your email address on the form at the top of the page. – The winners will be chosen via a lottery drawing and notified on Tuesday (11/3) via the email address they used to enter. – See complete Official Rules for entry instructions, full prize descriptions, restrictions and other important details.